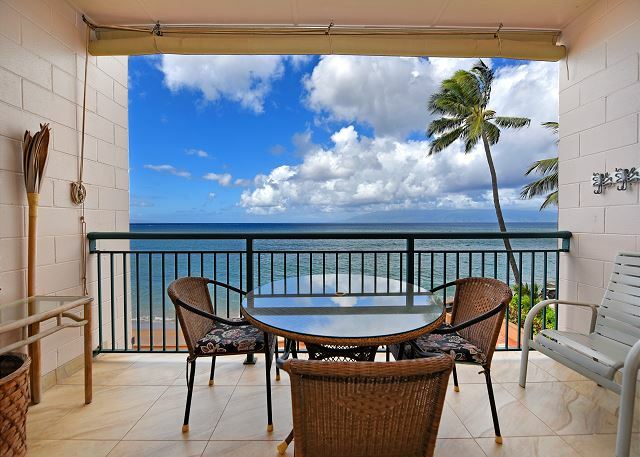 Makani Sands townhouse #309 is a 3 Bedroom, 2 1/2 Bath condo on the 3rd & 4th floor with 3 lanais, and an incredible view of the ocean our neighboring islands of Molokai & Lanai. This three bedroom townhouse, recently remodeled, comes equipped with 4 cable TVs, VCR/DVD/VCR & a Bose stereo system. Upstairs, there is a king bed in the master bedroom with private bath, and a queen bed in the guest bedroom with bath. Downstairs bedroom has twin beds. There is also a sofa bed in the living room for extra guests. There is a newly remodeled, totally modern kitchen downstairs with all the necessary appliances. Let the waves lull you to sleep with two ocean front lanais. There is a 3rd lanai on the Mt. side. Enjoy a day on our beach snorkeling, swimming, or sunbathing right outside your door. This condo also has a SAFE for your valuables. 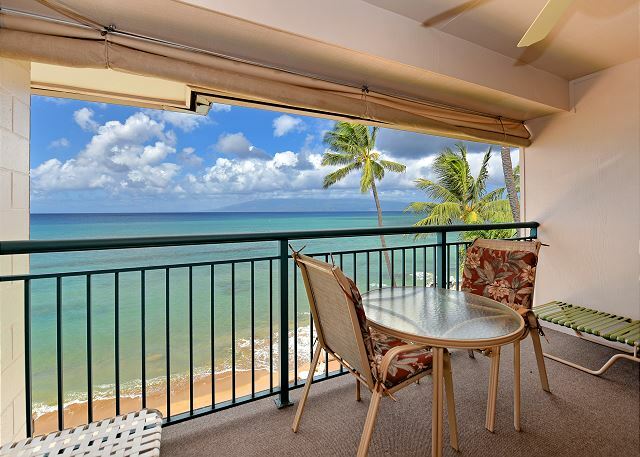 Come and experience West Maui in Makani Sands condo #309 your home away from home on Maui! The condo was directly on the beach with a fantastic view from 2 lanais; turtles right off the shore every day! Whales very active in the area with a great view. The condo was well equipped with meal prep utensils and in good working order. The only issue was the carpeting on the stairway and upper 2 bedrooms which was extremely warn. We would definitely stay here again and the property manager was fantastic, very informative and always available. Our rating would be straight 5's if not for the carpeting! The condo was clean. Some of the appliances did not work well, but small issues. Many whales and turtles to view from the Lanai. Not too bad overall. Great place, wonderful views, watched the whales and turtles. This was our to second time to stay here. Can’t wait to for our next stay. Thank you so much, we loved the views. The property is great, bathrooms and kitchen have been redone. The issue with this unit is all the mattresses, carpet and furniture is dated to the point that we were both having back pain from the beds, especially the master. It's a pretty easy fix these days to get a mattress delivered, even in Hawaiii. Marie was so pleasant to work with. Answered all my questions and was very helpful when we made to have a package delivered during our stay. We stayed in unit 309. 5 Adults and 2 young children. The views were amazing! I watched the sunrise from the back lanai and sunsets on the 2 balconies’ facing the ocean. Just spectacular. Turtles swimming just outside and we were also able to see whales coming out of the ocean from our balcony. The location was very convenient for us. Although there is no real beach to sit on outside the condos, we had no issues driving 5-10 min to visit several amazing beaches nearby. The management staff was kind and worked with us. We had a very pleasant experience with them. The inside of the condo could use some updates. Especially living room sofas and mattresses. The kitchen and bathrooms were fully renovated and beautiful. Would stay here again in a heartbeat. We only used the pool one day. It was larger than I expected and lots of room to sit around the pool as well. I was responsible for booking a Condo that would make my wife, brother, parents, and kids happy. This is not an easy task! I must say that the 3 bedroom and 2.5 condo at Makani Sands was amazing. The upstairs was spacious with 2 bedrooms, 2 baths and laundry room. The downstairs had a bedroom, half bath, and living room with sleeper sofa. The master bedroom and living room had a huge lanai which were used every day and comfortable. The grilling facilities were amazing and also the management was attentive to all needs. These guys are pros! If there is any feedback to provide I would say that the management can make sure that kitchen appliances are functioning properly, but I can imagine this is hard to upkeep with so many people visiting. Thank you Makani Sands! Been coming over 35 years. As usual, my family and I had a wonderful stay at the Makani Sands. It has been our home away from home for a long time. We were a party of 6 and had an amazing time in our rental! Stepping out on to the balcony and seeing so many green sea turtles was amazing! The management were on site and ready to help at a moments notice. I would stay here again and again. You can't beat the location, the views and the sunsets. We did miss the beach which has disappeared, but we could walk down a few steps and snorkel with all kinds of fish and turtles so that made up for it. We stayed here in March with 5 adults and 2 babies. The location of the condo is very convenient to Honokawai where we could easily pick up food, groceries and souvineers and walk to the beach/park which was perfect for our kids (the nearby beach has a reef that blocks the waves and makes a shallow clear pool for the babies to play in) We saw turtles every day from the balcony, whales from the beach and on the last day, a huge monk seal was sleeping on the beach like it was no big deal. The condo itself was roomy enough for all of us. The second floor lanai was particularly relaxing and nice. Eating outside on the balcony at sunset everyday was amazing. Make sure to turn off the lights at night or else bugs will fly in through the screen into the house. The bathrooms felt resort like and had everything you needed. No real complaints, we were worried about no AC but it was not a problem in March at all! Great Location & Great Place! Vacation was amazing. Our view was beyond my expections, humpback whales playing and turtles swimming everyday. The view was breath taking. The condo was clean & quiet. We had a really great time at Makani Sands. The rest of our family stayed at a time share nearby, but I'm so glad we had our own apartment here. Everything was great. There are slats on the bedroom doors so the wind can move through and there was no AC. But we loved the breeze that came through AND the wonderful little beach and sand wall. It was perfect for us, and we had daily afternoon Turtle swims out back. I will definitely recommend to any small family who wants a chill and laid back atmosphere. 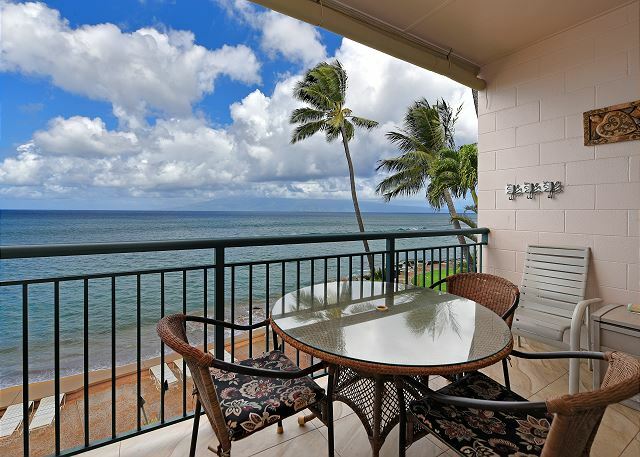 Perfect location, convenient to everything in West Maui. We loved our stay at Makani Sands so much! A great location - walking distance to a number of fantastic (and affordable, which is awesome in West Maui) eating spots and a cute beach park which our kids loved, and short drives to many other great beaches. The condo was well appointed, the pool great for our kids - shaded in the afternoon so perfect for an afternoon dip when you've spent the morning in the sun. The condo had everything we needed, including a bunch of beach and pool toys and beach chairs. We had a lovely time and will definitely be back. Oh, and the sea turtles! We saw them come up to the rocks pretty much every afternoon from our balconies. Such a treat. One note - from the photos it looks like there is a real beach in front of the building. There really isn't - it's a sea wall with mostly rocks, a tiny bit of sand, but except at very low tide the ocean is right up against the wall. You could still swim (we didn't) but it's not a real beach. Condo is as described, very nice and clean. 2 lanais over the beach, one facing mountains. Watch surfers, paddle boarders, whales, and turtles from the lanai or oceanside sunning deck. Kitchen is well stocked. Pool is warm and clean, with float loungers. Condo had some snorkel gear and property had surfboards and boogey boards for free use. Bert and Marie (property staff) were very nice, and helpful. Nice walking in neighborhood to organic store/deli/smoothie bar, with farmers market MWF and other shops nearby. We drove to other great beaches 10-15 mins north and south--Kaanapali, Kahekili, Napili, DT Fleming--for varied experiences. Couple disappointments: the beach is eroded and some days it was a little tricky getting from the stairs to the sand, having to climb a couple rocks while clinging to the stair railing. It is not a beach for walking. Also, our microwave and both DVD players were broken. Marie brought us new ones, and paid for our movie rental--but then we had to figure out how to hook the DVD up. a great time with a group of 8 of us. we really enjoyed the ocean front and the sound of the surf, with a daily show of whales turtles outriggers and more. the local market was great. We will be back. one item we didn't appreciate was an early morning call around 9 am from the office on our final day asking when we planned to leave !! Love Makani sands it's our home away from home. We loved everything about this condo. Big enought for two married couples each with private bedroom, one K one Q and bath. Updated kitchen. We loved being ocean front and the sound of crashing waves was wonderful. Enjoyed the pool and used the BBQ for many meals. The grounds are beautfully matained and the staff responed to our needs. We had a great time. The condo was exactly as depicted on line. The view was outstanding; we watched whales and turtles with our breakfast. The property is clean and well maintained. The staff is friendly and helpful. We did choose to swim at other beaches; this one was small and rocky. We were extremely pleased with our stay at Makani Sands. The unit we rented (309) was recently updated and was very comfortable for our family of 5. The location of the property is outstanding as you are just a few steps from the ocean and are very close to shopping and restaurants. Additionally, the property manager went over and above to pack and ship our bags home when an unexpected brush fire on the island prevented us from getting back to the condo during our last day in Maui. We saw turtles pretty much every day and at multiple times. Location was handy for getting around. The place could use a few fix ups; we noticed the cupboards and doors were a bit beat up. Some of the glass around the lanai areas were cracked or broken. But overall this place is excellent - I will come back next time i'm in Maui. Our family was in awe upon arriving at the townhouse! 2 balconies overlooking the ocean with sea turtles and whales in view, rolling waves and a sea breeze to lull you to sleep at night, we never closed the windows or screen doors. All the comforts of home plus snorkel gear, water shoes, beach chairs, umbrellas, boogie boards and much more provided. Centrally located to many activities and the office person and grounds manager were wonderful. Would definitely stay here again. Excellent location for whale and turtle watching. Amazing view. Would definitely stay here again. Units are on the smaller side, but we had 6 adults stay comfortably. Pool closed at 9:00pm and BBQ area closed at 10:00pm which was a little early when you are out sight seeing all day. we staied one of the biggest room in makani. At first we couldnt believe we were in so gorgeous room which has beautiful beach view and duplex?? also makani offers every kinds of source for cooking in kitchen. we have loved makani resort :). if we have a one more chance to go to mauii island, there is no doubt to book to the makani again ! We had a great time at Makani Sands. The unit was well equipped, and it has a really great view. We wouldn't hesitate to re-book at this location. Only small downside was that the carpet was damp from cleaning for the first few days and the ceiling fan in the master bedroom wasn't working, although they had someone in to fix it after 4 days - so the second half was cooler than the first half. Breath taking Views, clean grounds & private beach !!! Great condo, clean, easy beach access and easy commute into town. highly recommend!!!! great place to stay with kids too! The staff are very friendly and helpful. We enjoyed our stay. and children. Because of the intentisty of the weather and the continuing heat it was somewhat like a day in Phoenix. Adequate cooling provision would have been deeply appreciated. We purchased four fans and then shared them with others when it came time for our departure. The facility needs to take guest comfort under consideration when it comes to excessive warmth. We stayed 1 week in unit 309. We were 5 people. It is exactly as you see it on the pictures. It is very comfortable, very clean, we had everything we needed. The building is old but the unit inside has been updated. The swiming pool is very nice, safe and clean. What we love the most was the private beach. The building manager, the rental office ladies and the cleaning staff were very helpful and friendly. We really liked it there. Next time in Maui we will comeback to Makani Sands. We highly recomended. (The only thing that needs to be change is the mattress in the pull out couch. We didn't use it but we checked it out and you can tell the mattress is worn out. An adult won't be comfortable sleeping there). There are ants, it is very common in tropical contries, but if you keep the countere, the tables clean, and your food in the fridge or packed you won't have any problem. Personalized, comfortable and genuine come to mind as I reflect on our last 10 days. Spacious bedrooms with private lanai and spa like bathrooms upstairs. Large kitchen, everything a cook needs,brith dining area and seats for all on main lanai. Beach at low tide, sea turtles, and very nice Bar B Q. Sunsets were magical. The facility attracts Pleasant people who assemble to create their own ritual of sea shell horns filling the are with whale like tones as the sun crosses the horizon. This atmosphere is is the result of the facility staff who are our hosts. We are having a great time and are staying another 22 two days in a different unit. The condo was as described and very nice. The kitchen had everything we needed and was well appointed. The pool was not as lovely as the pictures online would suggest and you had to swim in the morning to get any sun. This is a non-smoking property, unfortunately there were some very rude and inconsiderate smokers who were constantly smoking so that smoke came into our lanais and condo. Management did try to rectify the smoking situation to no avail, overall a nice place to stay, however, if smoking is a big issue with you, as it is with us, don't think this is truly "smoke free". We had a wonderful stay at Makani Sands. We were a group of friends - two married couples and two single women - and condo 309 was perfect for us! The condo was well stocked with everything we needed and the view of the ocean on the lanai was beautiful! We watched whales every morning during coffee and the sound of the waves at night could be heard even in the back bedroom if we left our doors open. We had two rental cars and never had a problem with parking. There was a potluck gathering for all the condos on Tuesday evening and we met other visitors as well as residents. The beach was perfect for swimming and snorkeling and gear is provided. I would definitely stay at Makani Sands again! Our family loved staying in unit 309. It had everything we could need for a home away stay. The location was fabulous and loved swimming with all the sea turtles and snorkeling right off the beach. Roseanne and Bert were there when we needed them and would recommend staying at Makani Sands. 20 of us, all related, had a great time. 309 is an updated, clean 2 storey unit with very good kitchen, bath, laundry amenities in a well maintained building. 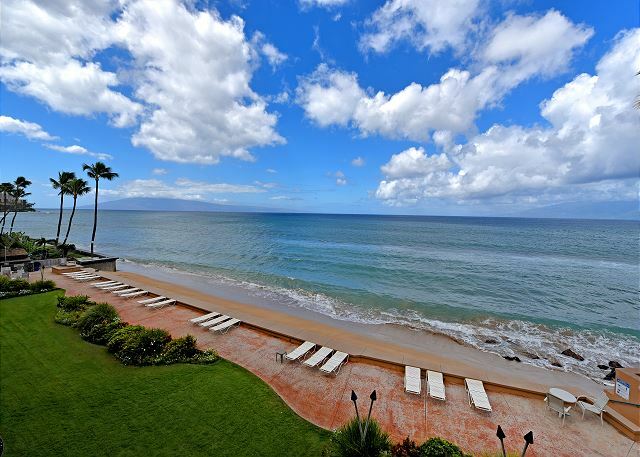 Fantastic oceanfront location with regular sea turtle visits, whales in the distance and the sound of waves 24-7. Loved the large master BR with floor to ceiling glass and it's own lanai. Planned to use the sofa bed but the mattress was not great so we used the lower trundle mattress instead. No A/C but building is oriented to catch mountain breezes, so was always comfortable. Easy walking distance to groceries, coffee shops and some restaurants. Outdoor common areas along the sea wall are on the basic side, but adequate and always clean. We didn't use the pool area, so can't comment. this was the perfect place to stay we loved it and will be back!! We spent a pleasant week at Makani Sands over Christmas this past December. The property was clean, well-furnished and had a great view of the prepared for ocean sounds all day and night! Can't think of anything we didn't like. Recommended.